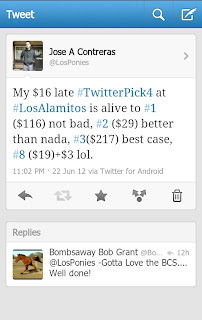 To my loyal visitors of my blog, i was not able to post full card selections with comments and analysis yesterday for Los Alamitos but hope you guys kept a lookout to my twitter feed for some winning pick fours. 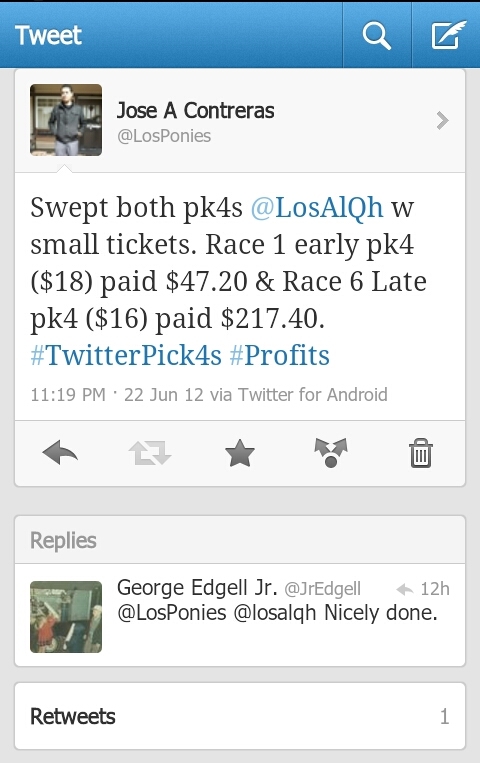 Not big scores at all but profits and good racing followed. 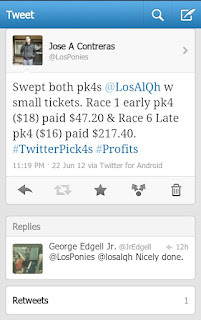 There was a couple nose defeats that could have bumped up the payouts much further but i will take any winners all day long. 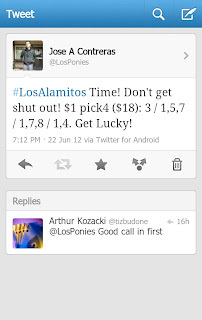 All we can do as horse players is pick the winners and let the odds fall into place. I am guilty of trying to beat a favorite when in reality you just have to take the favorite and move on. 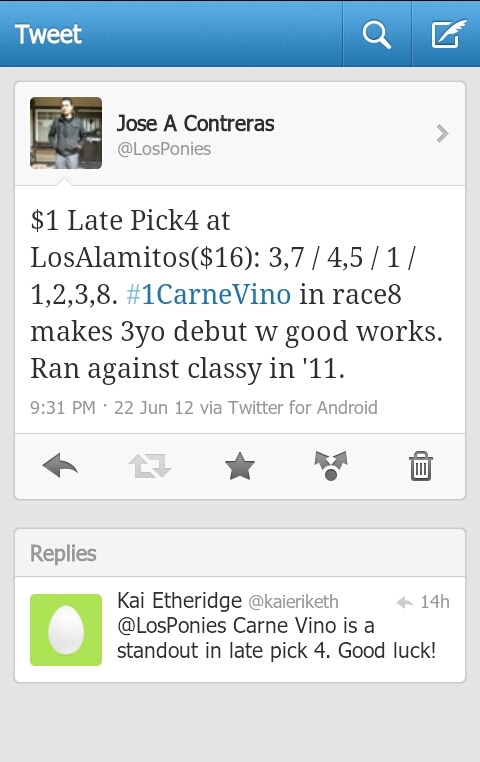 That is what happened in last night's late pick four when i really thought #1 Carne Vino in race 8 was a standout in class and talent but i was still trying to find a knock on him to try and beat him when i was handicapping. 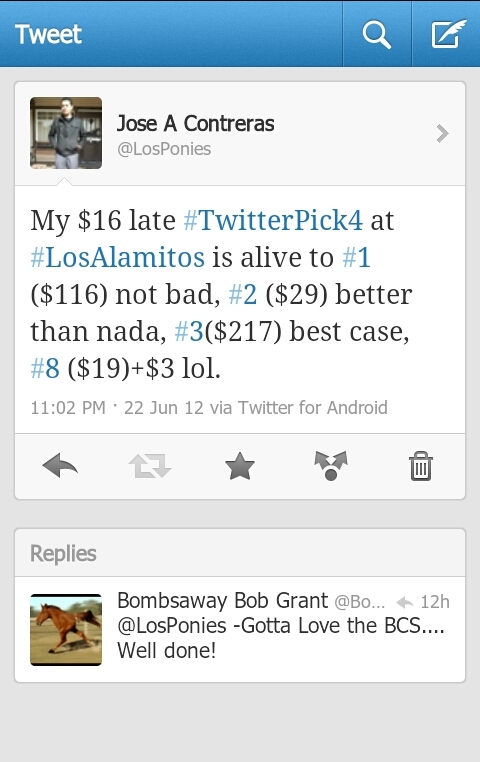 Instead i just took him, singled him and looked for value somewhere else and it was nice to close out the pick four with a 18-1 shot. 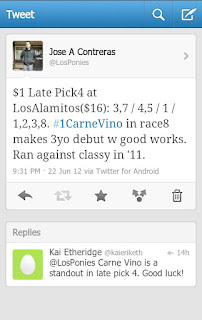 I am back blogging and will post selections for tonight's card later today. Come back later for some plays. A big shout out to all the regular followers and the new followers. As well as the usual Los Alamitos players @Tony_Pk4, @BombsawayBob, @TheLosAlEdge, @tizbudone, @JoshSouthworth, @Kaieriketh... just to name a few.